Caldecote deserted village is mentioned in the Domesday Book, but had reduced to ten householders in 1428 and is believed to have become completely deserted by the late 16th century. Two fields contain the sites of masonry buildings, and one retained crofts and ridge and furrow with a street along its west margin before being affected by modern agricultural activity. Casual survey and metal-detecting in recent years have recovered pottery sherds, coins and metal objects dating from the Iron Age to post-medieval periods. A small number of prehistoric worked flints have also been found, including a blade of probable Mesolithic date. Ten householders in 1428. (S2). The two fields are sites of masonry buildings. . One field has crofts and ridge and furrow, with street along west margin. . This was a scheduled ancient monument but was destroyed by agricultural activities, and is now descheduled. North, south and west of Caldecote Farm: surface scatter of Late Saxon sherds from site of deserted medieval village, including St. Neots ware was recovered. M. Langham-Lopez (HES), 25 February 2013. July 1976. OS air photography. D. Voisey, 3 February 1995. A. Rogerson (NLA), 14 October 2002. Large quantities medieval and Late Saxon metalwork (S4, S5 and S6). Possible bracelet or Early Saxon wrist clasp (S7), post medieval metalwork, medieval sherd. See list and plan in secondary file. E. Rose (NAU), 31 January 1985. January to February 1993. Metal detecting. Roman, Early Saxon, Late Saxon and medieval metal objects. See list in secondary file. A. Rogerson (NLA), 31 March 1993. Roman, medieval and post medieval coins. Roman, Middle Saxon, Late Saxon, medieval and post medieval objects. See lists in secondary file and map. A. Rogerson (NLA), 9 May 1995. August 1995. Metal detecting. .
Iron Age, medieval, post medieval coins. Roman, Early Saxon brooches (S8). See lists in secondary file. A. Rogerson (NLA), 2 October 1995. November to December 1995. Metal detecting. . Bronze Age, Roman, possible Middle Saxon or Late Saxon, medieval and post medieval metal finds. Medieval and post medieval tokens. A. Rogerson (NLA), 30 January 1996. March to April 1996. Metal detecting. .
Late Saxon brooch, medieval, post medieval metal finds. A. Rogerson (NLA), 8 August 1996. Four-part post medieval lead cloth seal. Outer discs illegibly stamped, or possibly not stamped at all. Inner discs have well-made and well-preserved stamps of a crown on one side, and two lions passant with a date (16) below on the other. Official alnage seal, late 17th century. A. Rogerson (NLA), 1 August 1998. August 1998. Metal detecting. .
One medieval and one post medieval coins. A. Rogerson (NLA), 4 October 1998. October 2000. Metal detecting. .
Roman pin, medieval metal finds. A. Rogerson, 30 November 2000. October to November 2001. Metal detecting. Iron Age brooch, Roman brooch. A. Rogerson (NLA), 4 January 2001. Before 11 September 2002. Metal-detecting. One probably Mesolithic blade and three undatable Prehistoric flakes, see description in file. Possible Roman, medieval and post medieval metal finds. A. Rogerson (NLA), 2 October 2002. Before 15 January 2003. Metal detecting. A. Rogerson (NLA), 24 February 2003. Before 3 October 2003. Metal detecting. Iron Age, Roman, medieval and post medieval metal objects. A. Rogerson (NLA), 27 November 2003. Before 24 June 2004. Metal detecting. Middle Saxon, medieval and post medieval metal objects. A. Rogerson (NLA), 21 July 2004. Before 21 July 2011. Metal-detecting. Late Saxon copper alloy unidentified object (S9). Post-medieval harness mounts, a lead cloth seal, button and a dress fastener. S. Ashley (HES), 6 June 2012. Before 26 July 2011. Metal-detecting. Post-medieval button, shoe buckle and thimble. S. Ashley (HES), 15 June 2012. Before 16 August 2011. Metal-detecting. Medieval annular brooch and strap-end. 1 Late Iron Age coin. 11 medieval coins and 2 jettons. A. Beckham (HES), 4 December 2012. Late Saxon/medieval copper alloy finger ring. 9 medieval coins, buckles, bar mounts, strap-ends, folding strap clasps, a brooch, strap mount, strap plate, strap loop, thimble, dress fastener and a sheet copper alloy unidentified object. Post-medieval hinge, a possible furniture tack and a crude copper alloy ring, possibly from a sword belt fitting. A. Beckham (HES), 11 November 2013. 14 medieval coins, buckles, strap-ends, brooches, a mount or buckle plate, a decorative rivet, folding clasp, seal matrix, bar mount, ampulla, belt mount, swivel from a leash, a lace tag, sword scabbard chape, papal bull and a brooch made from an English jetton. 1 medieval/post-medieval coin and 1 jetton. Post-medieval bell and harness mount. The medieval silver ring which was found in September 2013 and reported as Treasure Case 2013 T626, was declared treasure at inquest. E. Darch (HES), 20 January 2014. --- Article in Serial: Coulton, J. J. 1895. Names on the Wissey. Norfolk Archaeology. Vol XII pp 13-24. pp 20-21. --- Aerial Photograph: OS AP 413 76 124; TF7403 A-D,L-P.
--- Aerial Photograph: OS 76-124-411. --- Aerial Photograph: OS 76-124-412. --- Aerial Photograph: OS 76-124-413. --- Monograph: Ashley, S. 2002. Medieval Armorial Horse Furniture in Norfolk. East Anglian Archaeology. No 101. --- Photograph: 2002. KTB 30-32, Romano British disc brooch..
--- Photograph: 1995. LCM 0-1, Iron Age coin depicting boar/horse..
--- Photograph: 1995. LCY 1-2, Middle Saxon viking pendant..
--- Photograph: 1995. LCY 3-5, Medieval seal matrix..
--- Photograph: 1995. LCZ 35-36, late Saxon mount..
--- Photograph: 1995. LCZ 37, Middle/Late Saxon hooked tag..
--- Article in Serial: Gurney, D. (ed.). 2003. 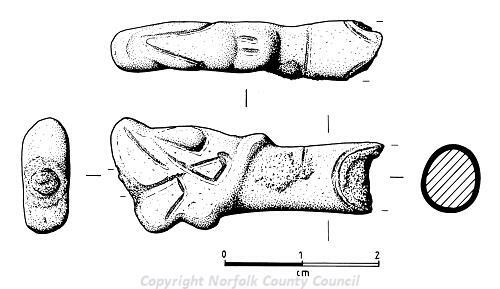 Archaeological Finds in Norfolk 2002. Norfolk Archaeology. Vol XLIV Pt II pp 356-368. p 357. <S1> Monograph: Wade-Martins, P. 1980. Fieldwork and Excavation on Village Sites in Launditch Hundred, Norfolk. East Anglian Archaeology. No 10. pp 78-81. <S2> Article in Serial: Davison, A. 1984. The Desertion of Caldecote: Some Further Evidence. Norfolk Archaeology. Vol XXXIX Pt I pp 53-54. <S3> Article in Serial: Wilson, D. M. and Hurst, D. G. 1962. Medieval Britain in 1960. Medieval Archaeology. Vol IV (for 1961) pp 309-339. p 309. <S4> Illustration: Ashley, S.. 1984. Drawing of a Late Saxon copper alloy buckle.. Film. 1:1. <S5> Illustration: Ashley, S.. 1984. Drawing of a Late Saxon copper alloy strap-end.. Film. 2:1. <S6> Illustration: Ashley, S.. 1984. Drawing of a Late Saxon silver finger ring.. Film. 2:1. <S7> Illustration: Unknown. 1984. Drawing of an Early Saxon wristclasp.. Card. 2:1. <S8> Illustration: Ashley, S.. 1995. Drawing of an Early Saxon armbrustfibel brooch.. Film. 2:1. <S9> Illustration: Gibbons, J.. 2012. Drawing of a Late Saxon unidentified object.. Film. 2:1.